Unless you're a wildlife rescuer, always contact a wildlife rehabilitator. Wild animals should be rehabilitated and released whenever possible. Use untreated wood. Treated wood contains toxins that may harm animals. Wear protective eyewear when using circular saw. For long-term squirrel housing, raise your cage off the floor with wheels or place it on blocks. Squirrels are happier if their cages are not on the floor. Add tree branches to the inside of the cage for your squirrel to climb on. According to Mary Cummins, licensee with the California Department of Fish and Wildlife, it is not legal in all states to keep a pet squirrel. Most states, including California, require a nontransferrable permit. Housing a squirrel is otherwise considered an illegal act. Should you be permitted to keep a pet squirrel, or find yourself a squirrel rescuer, you can fashion a squirrel cage from materials purchased from your local home improvement store. Measure your space to be certain your cage will fit. 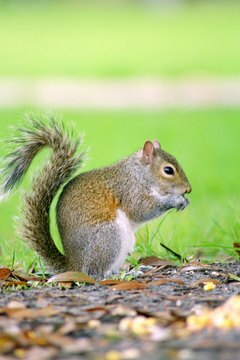 Squirrels require a cage that is taller than it is wide. Your cage will be 4 feet tall, 18 inches deep and 2 feet wide. Measure out your plywood pieces. You'll need one rectangular piece measuring 2 feet by 4 feet, a second piece measuring 18 inches by 6 inches, and two pieces measuring 2 feet by 18 inches. Measure your 2-by-2s. You'll need six 14-inches pieces, four 4-foot pieces and six 20-inch pieces. Additionally, you'll need two small pieces 7 inches in length. Cut all your pieces using the circular saw. Build two large rectangular frame pieces using two of the 4-foot 2-by-2s and two of the 14-inch 2-by-2s for each piece. Attach the pieces using the nail gun and nails. Attach both frame pieces to the largest cut of plywood. This large plywood piece will become the back of the cage. Attach the frame to the plywood piece using the power screwdriver and wood screws. Attach the top and bottom plywood pieces. Use the 2-foot-by-18-inch pieces for the top and bottom. Attach using the power screwdriver and wood screws. Slide two of the 14-inch pieces of 2-by-2 into the existing frame, which are the sides of your cage. Center them between the top and bottom. Attach with the nail gun and nails. Slide another 14-inch of 2-by-2 into the right side of the frame, 6 inches above the bottom. Make sure this measurement is accurate. You'll attach a small door here that you'll use to open to remove waste. Slide a 20-inch piece of 2-by-2 into the front of the cage at the bottom flush with the plywood bottom. Attach it to the plywood bottom with the power screwdriver and wood screws. Attach to the side frame with the nail gun and nails. Slide a 20-inch piece of the 2-by-2 into the front of the cage at the top flush with the plywood top. Attach it in the same manner as in step 10. Slide a 20-inch piece of the 2-by-2 into the front of the cage at the center point between the top and bottom of the cage. Attach to the side frame with the nails and nail gun. Slide a 20-inch pieces of the 2-by-2 into the front of the cage vertically. Center this piece. Attach to the frame with the nails and nail gun. Add the wire mesh to the sides and front of the cage. Attach the wire mesh with the staple gun and staples. Place staples a few inches apart to make sure mesh is secured properly. Leave the 6-inch opening on the right side for your waste-removal drop door, and leave an opening in the front on the upper left-hand corner where you'll fashion your door. Attach the waste-removal drop door. Use the 18-by-6-inch plywood piece for this step. Attach to the bottom of the cage with the hinges, so the door opens toward you. Attach a hook and eye lock to keep the door closed when not in use.